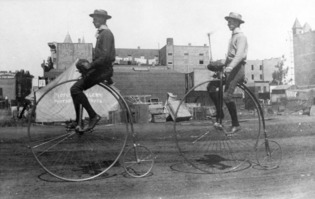 2 The people of Victorian England enjoyed a variety of leisure time activities. Whether it was a tea party with friends, a stroll in the park, or a game of charades, there was always something enjoyable to do. 3 There were sports to play and to watch. Cricket, golf, rugby, tennis, bathing (we call it swimming), bicycling, skating, badminton, and croquet were just some of the popular sports. Some were organized team sports like cricket, which was a little like baseball but with a flat bat. Others were backyard games that anyone could play. Croquet, with its wooden mallets, wooden balls, and willow hoops was one of these. 4 Swimming was especially popular at the seaside, and there were other types of recreation available at seaside towns as well. There were outdoor bandstands with brass bands, and there were attractions like you might see at a fairground today. Another favorite activity at the seaside was strolling along the promenade, which was something like our boardwalks. 5 In fact, strolling was a popular activity in many locations, not just at the beach. Girls, boys, couples, and families would dress in their best clothes and take a stroll in a nearby park. It was a good way to meet friends and neighbors as well as a way to see what everyone else was wearing.